Laramie County Master Gardener Kathy Shreve prepares a trench for seeds in a raised bed set up with soaker hoses. Photo by Barb Gorges. I spent a recent evening in the garden with Kathy Shreve, Laramie County master gardener, reviewing what to know about local vegetable gardening. The topics mentioned here are covered in greater depth in the “gardening” section of the Cheyenne Botanic Gardens website, http://botanic.org, which also has the link to the archive of my previous columns. Wait until the end of May or later to transplant tender veggies like tomatoes, eggplants, cucumbers or put them under a season-extending cover like a low tunnel. You can also plant them in containers you can scoot in and out of the garage. However, Shreve started cabbage and onion plants indoors and planted them before the snow May 18-19 and they were fine. Some vegetables, like members of the cabbage family, don’t mind cold as much. While peas, cabbage types, lettuces and other greens, can be planted earlier than the end of May, most vegetable seeds planted directly in the garden prefer warmer soil temperatures. Measure with a soil thermometer found at garden centers. Shreve said we can plant as late as June 20. Plant fast growing crops as late as July if you want a fall harvest. Keep in mind the vegetable garden needs a minimum of six hours of sun per day, preferably morning sun. Shreve transplants cabbages she started indoors. Photo by Barb Gorges. If the plant was not outside when you bought it, it will need hardening off. Start with the plant in the shade for two or three hours and day by day increase the amount of sun and the length of exposure by a couple hours. Keep it well watered. When transplanting, Shreve advises digging a hole for your plant, filling it with water, then letting it drain before planting. To remove a plant from a plastic pot, turn it upside down with the stem between your forefinger and middle finger. Squeeze the pot to loosen the soil and shake it very, very gently. If there are a lot of roots, you can gently tease them apart a bit before putting the plant in the hole. Hold the plant by the root mass so that it will sit in the hole with the soil at the same level of the stem as it was in the pot. Fill soil in around the roots, then tamp the soil gently. However, tomatoes can be planted deeper since any part of their stem that is underground will sprout roots, the more the better. In fact, Shreve said to pinch off all but three or four leaves and bury the bare stem. Lastly, keep plants well-watered, not soggy, while they get established. Wait a couple weeks before adding fertilizer to avoid burning the plants. Shreve mulches with certified weed-free straw available at local feed stores, but grass clippings and last year’s leaves can also be used. Placing mulch 2 to 3 inches deep keeps the soil from drying so fast, shades out weeds and keeps rain and overhead watering from spattering dirt onto plants, which may spread disease. It can also keep hail from bouncing and inflicting damage twice. Root crops, like carrots and beets, don’t transplant well, so you are better off starting them from seed. While fresh is good, Shreve said she’s had luck with seed seven years old. But the germination rate isn’t going to be great. She might spread carrot seed a little more thickly if that was the case, and it’s easy to thin to the proper spacing (and the thinnings can be tasty). Because Cheyenne is dry, Shreve plants in a little trench. That way, when moisture comes, it will collect down where the plants are. Seed packets tell you how deep to plant. The rule of thumb is three to four times deeper than the breadth of the seed. Lay the seed in the bottom of the trench and sprinkle that much dirt on them. Then water well, but gently, so you don’t wash out the seeds. Keep the soil surface moist until the seeds germinate. Lightly mulch when the seedlings are visible, adding more as the plants get bigger. Mark rows with popsicle sticks or plastic knives left from picnics. Once plants are established, let the top 1-2 inches of soil dry out between waterings. Test by sticking your finger in the soil. Water deeply. Shreve waters every other day using soaker hose and drip irrigation systems, except when it rains. She originally tested her system for 30 minutes to see if water made it to the root depth and decided on 40 minutes. Water in the morning, or at least make sure leaves are dry before dark. Mulch should eliminate most of the need to weed. Shreve said to keep up with it—it’s easier to pluck weed seedlings than to have them establish deep roots and go to seed. For bugs, Shreve said it is easy to Google “what insect is eating my cabbage,” or take the critter, or evidence, to the Laramie County Extension horticulturist, Catherine Wissner. Her office is now out at Laramie County Community College, fourth floor of the new Pathfinder Building. Never use pesticides until you identify your problem, and then try the least toxic method first. Again, more is not better. Never apply more than the directions indicate. Slugs—my nemesis—indicate a garden is too wet. Shreve said to roll newspaper to make 1 to 2-inch-diameter tunnels. Place rolls around affected plants in the evening. By sunrise, the slugs will be inside the rolls to get away from the light and you can dispose of them, rolls and all. Never add wood ash or lime to our alkaline soils as those work only on eastern, acidic soils. Shreve likes slow-release products which are less likely to burn the plants, as are the natural fertilizers. Additionally, compost tea is a good soil conditioner. Again, more is not better. Shreve uses half of what is directed until she sees how the plants respond. Over-fertilization of fruit-producing vegetables like tomatoes often keeps them from producing the flowers that become the fruit. Shreve said they need to be stressed a little bit because it gets them thinking about preservation of the species and producing seed, rather than just enjoying life and producing leaves. “Just leaves” is OK if you are growing leafy vegetables like lettuce, kale, spinach and chard. If you are growing vining vegetables, getting them off the ground means fruits stay cleaner and don’t rot, and they are easier to find and pick. Use old chain link gates, bed springs, or anything else—be creative. Hog panels make sturdy tomato cages 5 feet high and 2.5 feet in diameter for larger, indeterminate varieties, with chicken wire over the top for hail protection. Otherwise, use jute twine to loosely tie the stem to a bamboo stake. Adding annual flowers like alyssum, marigolds and sunflowers, or herbs including dill and oregano, attracts pollinators and beneficial insects to your garden. Categories: Choosing right seeds, Drip irrigation, Flowers, Garden maintenance, Garden pest, Gardening, hail, Hardening off seedings, Hardening off seedlings, Mulch, Raised bed gardening, Season extension, Seeds, Tomatoes, Tomatoes in Cheyenne, Transplanting seedlings, Trellis and vine, Uncategorized, Vegetables, Weeds | Tags: alyssum, annual flowers, beets, cabbage, carrots, Cheyenne Botanic Gardens, cucumbers, dill, drip irrigation, eggplant, fertilizer, fertilizing, hail protection, hardening off, herbs, Laramie County Master Gardeners, lettuce, marigolds, mulch, onions, oregano, peas, pesticides, slug, soaker hose, sunflowers, tomato, tomato cage, tomato diseases, trellis, vegetable gardening, vegetable pests, vegetable seeds, vegetable transplanting | Permalink. Laramie County Master Gardener Michelle Bohanan displays one of the milk jugs she uses for winter sowing. When I asked her for tips on starting perennial seeds this spring, Laramie County master gardener Michelle Bohanan said, “winter sowing.” I soon discovered it is an increasingly popular concept and practice. Winter sowing is what our native and other temperate zone plants do naturally. After they set seed, the flowers and fruits dry. Within months or years, they either shatter and release the seeds, a messy bird picks at them, or the wind blows them. You might shred a few dried flower heads yourself from time to time. The seeds eventually come in contact with the ground where they are subjected to moisture and cold. That, and the cycles of freezing and thawing, eventually break the seed coat which is necessary if it is tougher than the strength of the seedling. Surprisingly, many seeds require light to germinate. Day length, or cumulative solar warmth, tells them when it is safe to sprout. With our occasional spring snowstorms, it’s good that not all seeds, even of the same variety or species, require the same exact amount of light and heat. If the first up are frozen out, the slower germinating fill in behind. Of course, the plants that have winter sowing down to a fine art are the weeds. The problem with merely sprinkling seed over your flower bed is that seed is expensive and you don’t know how hungry your local birds and mice are going to be. It occurred to New York state gardener Trudi Davidoff to safeguard her winter sowing by seeding in shallow, covered containers she set out in her garden. In spring, there was no need to harden off the seedlings since they were already acclimated to the outdoors. She merely transferred them into her garden. Another benefit? No need for grow lights or heat mats. She’s been spreading the word since. Cut the milk jug just below the handle, forming a pot 4 inches deep, and a separate cover. Photo by Barb Gorges. I visited Bohanan on a nasty day in January with half a foot of snow on the ground. I brought along a translucent plastic gallon milk jug and a little packet of alpine aster seed I’d received in a seed exchange. With a pair of heavy-duty scissors, Bohanan punctured the jug just below the handle and cut all the way around, creating a 4-inch high pot and a separate cover. She put in about 3 inches of her favorite commercial potting soil, already moistened. Next, she spilled a couple dozen seeds onto a plastic container lid and with a toothpick, sorted through them, kicking out any unfertilized seeds. They look lighter because they don’t have the germ of the seed needed for germination. Seeds that require light to germinate are placed touching the surface of the potting soil. Photo by Barb Gorges. Like many small seeds, these require light, so Bohanan gently pressed 16 into the soil but didn’t bury them. Then she forced the upper half of the milk jug, upright, into the bottom half to protect the seeds, leaving off the jug’s cap. In other, wetter climates, the top and bottom can be slashed to allow snow and rain to water the seeds and then drain, but in our drier climate, Bohanan has had, over seven years, good results without making additional openings. However, I found I had to puncture the bottoms after the snow on top of my jugs began to melt. On the Internet, a search for “winter sowing” shows many kinds of recycled containers. The bottom needs to be at least 3 inches deep for the soil and the top needs to clear the soil surface by at least 2 inches. The top also needs to be clear or translucent. You provide adequate ventilation and drainage openings as needed. On the jug in permanent marker Bohanan wrote the name, source and number of seeds and the date of planting. The planted milk jugs can be safely left out in the cold and snow. The seeds will sprout in the spring. Photo by Barb Gorges. Back at home, I put the milk jug in a snowdrift on the northeast side of our back fence. While I wait for spring, I’ll empty more milk jugs and try planting more seeds. Bohanan already had 35 jugs going and figured she was only 25 percent of the way through her winter sowing plans. This technique is easier than my experience last year sprouting orange butterfly weed—a type of milkweed. I had to leave the seeds, planted in moist potting soil and covered with plastic, in my refrigerator for 6 weeks to achieve “stratification,” the term for this cold treatment. Other seeds need scarification, scratching a break in the seed coat, and this winter sowing method can help. While seeds left lying on the ground require no help from us, ones in containers do. Bohanan’s milk jugs have the opening at the top, plus the gaps where the upper part of the jug is pressed into the bottom, that allow for some snow and rain to seep in and some heat to escape when it warms up in the spring. She forgoes slits in the bottom because she puts some jugs in her unheated sunroom and would rather not have them leak on the floor. However, she does check her jugs regularly to make sure they don’t dry out, especially the ones under cover of her hoop house. She can tell by the lighter color of the soil (although this doesn’t work for all potting soils), or she can lift the jug and tell by the weight if it needs watering. Knowing how much water to add might be a trick, and if you think you might be prone to overwatering, you should probably add bottom drainage openings. When the weather gets warm, to keep seedlings from baking, it is necessary to pull the top off and prop it on the bottom diagonally or even remove it entirely during the day. All of this still sounds easier and cheaper than setting up lights or buying starts next spring. With our last frost nearly three months away, there is enough time to accommodate even seeds that need 8 weeks of cold. But figuring out where to put your jugs is also important. Placed along the south-facing wall of your house may cause some seedlings to sprout too soon. Along a north-facing wall may delay them. But the mini-greenhouses are easy to move. Just experiment. Try native perennials from our northern temperate climate, Zone 5 or colder, especially if you are turning your lawn into bird, butterfly and bee-friendly habitat. Popular flowers include varieties of penstemon, coreopsis, milkweed and gaillardia. Try cold-tolerant vegetables from the cabbage family, herbs and flowering annuals, but probably not slow-starting annuals like petunias. It would take all summer for them to finally bloom. The seeds of tropical plants, like tomatoes, eggplants and peppers, may also get started too late to produce before first fall frost. Instead, see tomato growing advice archived at www.CheyenneGardenGossip.wordpress.com. Winter Sown, www.wintersown.org: Trudi Davidoff’s site. Dave’s Garden, http://davesgarden.com/guides/pf/ws: Gardeners all over the country have recorded their success winter sowing a variety of plants, but be aware of what zone they report from. Alplains, http://www.alplains.com/: This catalog specializes in native plant seeds and has essential propagation information. However, use the following website to translate the Latin names. The Missouri Botanic Garden’s Plant Finder, http://www.missouribotanicalgarden.org/plantfinder/: This is one of Bohanan’s favorite sources of information. Typical native perennials for the Cheyenne, Wyoming area: Blanketflower, Gaillardia spp. ; Gayfeather, Liatris punctata; Tickseed, Coreopsis spp. ; Beardtongue, Penstemon spp. ; Black-eyed Susan, Rudbeckia spp. All photos by Barb Gorges. Categories: Flowers, Gardening, Hardening off seedings, Native perennials, Native plants, Seeds, Starting seeds indoors, Transplanting seedlings, Uncategorized, Winter sowing | Tags: Cheyenne, garden, gardening, Laramie County Master Gardeners, native perennials, native plants, perennial flowers, seed starting, seedling transplanting, stratification, Trudi Davidoff, Winter sowing, Wyoming | Permalink. Harden off seedlings before transplanting them by starting with just a few hours in the sun each day, gradually increasing the length of time. Cheyenne’s average growing season weather is very pleasant. It is just those pesky extremes averaged in, those bursts of hail, hard rain, wind, cold and heat that make successful gardening tough. Even though this spring has been unusually dry and warm, I’ve been expecting the other shoe to drop—snow. Did you gamble on more warm weather and put your plants out before Cheyenne’s recommended planting date of May 24? Remember, there is still a 10 percent chance of frost until June 8, so make sure you have your old sheets at the ready to cover your plants on a cold night. Or try a product called floating row cover, which is spun polyester fabric available at many garden supply centers. There are plenty of flowers and vegetables that weather a little frost–tulips, daffodils, crocus and other early bulbs and early perennials. Keep in mind for next year that pansies can be planted as early as April 15—and they bloom all summer. Among the vegetables, the cole crops such as cabbage, broccoli, and cauliflower, do fine with a bit of frost, either seeded directly or as transplants that were started even earlier indoors. No wonder cabbage-based dishes are a feature of ethnic cooking in cold, northern, short-growing-season countries. By the last week in May, it should be safe to transplant everything else and sow seeds for plants that don’t need a head start, such as marigolds, squash and pumpkins, or those that dislike being transplanted, such as sunflowers and nasturtiums. Some Cheyennites wait as late as the end of the first week in June to put in the heat lovers: tomatoes, peppers and eggplant. To find out how to choose plants at the nursery, I talked to Jessica Friis, the assistant education director at the Paul Smith Children’s Village at the Cheyenne Botanic Gardens. She is a graduate of the landscape management program at Brigham Young University and manages the Village’s gardens. “Ideally, you’d want smaller plants that aren’t root-bound. It’s hard to find that. Find some that haven’t bloomed yet. Make sure they have been well-watered and the soil feels moist,” she said. Businesses other than nurseries can sometimes do a good job of plant care, she said, but be careful. As you may know from previous columns, I’m challenging myself to grow tomatoes from seed, “Gold Nugget” yellow cherry tomatoes, and an annual flower, cosmos. I don’t feel so bad now, knowing they won’t be flowering when I’m ready to transplant them outdoors. When picking out perennial plants that will grow well here, look for those marked “Plant Select.” This is a breeding program partnership between Colorado State University, Denver Botanic Gardens and growers. This label is an indication that the variety will perform well in Colorado, which generally means it will also thrive in Cheyenne. You can find them in Cheyenne nurseries. Chances are that you are buying plants that were on display outdoors. If not, or you grew your own, give them an opportunity to gradually adapt to sun and wind, a process known as hardening off. Put them out for a couple hours one day, and a couple hours longer the next, increasing exposure over several days, making sure plants don’t wilt. Friis has a few tips for successful transplanting. For annual flowers and vegetables, turn the garden bed first (break up the soil crust), 6-8 inches deep. Then water it a day or two before you plant. Also: “Water plants really well before planting, getting them soaking wet,” she said. When you dig a hole for a plant, Jessica recommends making it twice the width of the root ball so the roots have an easy time growing. Make sure your hole is deep enough the roots don’t fold back on themselves. On tomato plants, you can even bury the second set of leaves. Hold the plant over the hole at the proper height and fill in around it with dirt. For plants that are root-bound, Friis said there is a debate about whether to “tear” the roots first. “Try to loosen them up without breaking them,” she said. When pulling annuals out in the fall, she said it is easy to see that roots that circled round and round in their pots before planting never grew any further out all summer—and neither did the plant tops. If not root-bound, keep the root mass intact as much as possible to lessen transplant shock. Otherwise, a plant has to re-establish all those little root hairs before the green part can start growing again. For seedlings in peat pots, the pots don’t decay much in the soil here and can inhibit growth. Break off the bottoms if the roots haven’t penetrated them yet. And don’t leave the rim of the pot sticking above ground—tear it off. In Cheyenne, we should space flowers more closely than recommended, Friis said. Since we have such a short growing season, flowers won’t otherwise fill in the garden completely until nearly the week before first frost (September 20), so planters at the Children’s Village are packed thick. She fertilizes closely packed planters every week. However, many perennials, especially natives, require very little fertilizing other than decomposing mulch. Don’t forget a layer of mulch for all your plants. Bits of semi-decomposed plant material, including leaves and grass clippings (don’t use fresh clippings though), will keep the soil from drying out too quickly. It also will shade out the weeds. Don’t leave mulch touching plant stems. And finally, water well each day for several days, until plants are established, but water carefully so plants don’t become mud-bedraggled. Read the seed packet directions to find out how deep seeds need to be planted. Try making a wide bed vegetable garden to avoid compacting the soil. See the Garden Tips sheet at www.botanic.org or pick it up at the Cheyenne Botanic Gardens. Don’t hesitate to thin seedlings as recommended, since crowding will decrease your yield, as a friend of mine discovered last year when she harvested the skinniest carrots she’d ever seen. I collected seeds from last year’s flowers: marigold, feverfew, penstemon and gaillardia. Since the seeds didn’t cost me anything, I can sprinkle them generously this spring where I’ve pulled the winter leaf mulch away around the fading tulips. I will water the seeds well and crumble a thin layer of old leaves over them for shade. My soil does not have a tidy, smooth surface so enough seeds always find the right spot to take root. Do you have trouble with rabbits snacking on your new plants? Friis has found that a short, rabbit-proof wire fence works better than deterrents that must be reapplied frequently. Next month we’ll take a look at other ways to mulch, water, fertilize and maintain a garden. 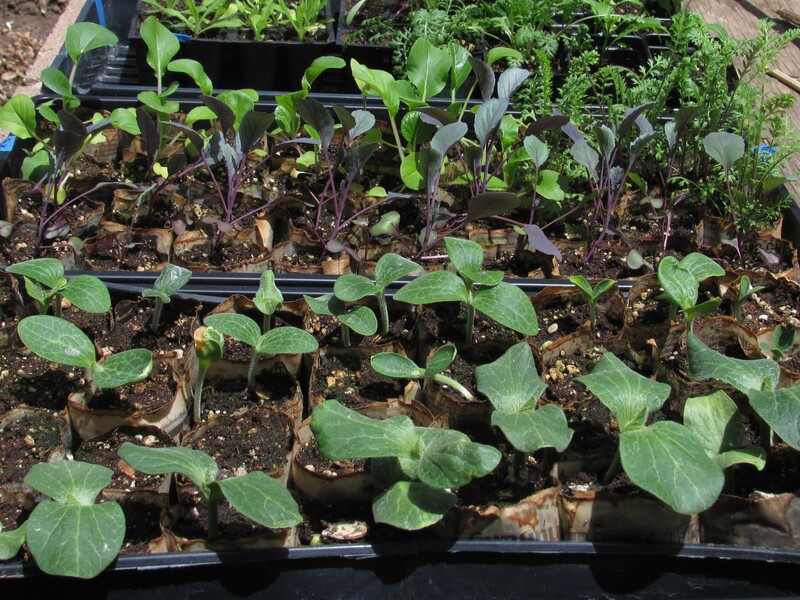 Categories: Transplanting seedlings | Tags: Cheyenne Botanic Gardens, direct seed, fertilize, floating row cover, frost date, harden off, rabbit-proof, seedling transplant | Permalink.